The National Football League lost one of its great players last night. Former Baltimore Colts tight end and NFL Players Association President John Mackey passed away at the age of 69. He had been suffering from dementia since his playing days. After being drafted in 1963 out of Syracuse, both by the Colts in the second round of the NFL Draft and the New York Jets in the fifth round of the AFL Draft, Mackey spent the first nine years of his career in Baltimore. He played 10 years in the NFL, finishing his career with the San Diego Chargers in 1972. Mackey caught 331 passes for 5,236 yards and 38 touchdowns, numbers that had not been seen by any tight end in NFL history up to that point. Tight ends were previously seen as a sixth offensive lineman, but Mackey revolutionized the position as a receiving threat, similar to the Chargers’ Antonio Gates today. He was big enough to provide strong run blocking, but also fast and athletic enough to be a vertical threat in the Colts’ downfield passing attack. Mackey led the Colts in receiving as a rookie during the 1963 season with 35 catches, 726 yards and seven TDs. He would also lead Baltimore during 1966 season with 50 catches, 829 yards and nine TDs. Five of his nine touchdowns that year were for 50 yards or more. 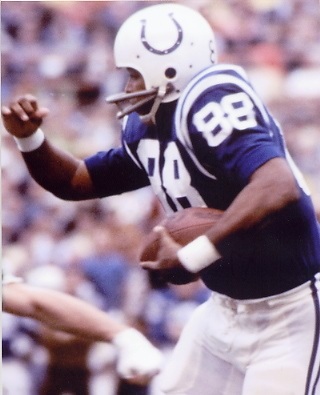 Mackey’s speed, size and athleticism led him to be selected to the 1963, ’65, ’66, ’67 and ’68 Pro Bowls, as well as a first team All-Pro after the ’66, ’67 and ’68 seasons. In Super Bowl V against the Dallas Cowboys, Mackey caught a 75-yard touchdown pass that helped bring Baltimore its first-ever Super Bowl in a 16-13 win. Mackey was so fast that the Colts actually used him as a kick returner for part of the 1963 season. He excelled there as well, returning nine kickoffs for 271 yards, good enough for a 30.1 yard per return average. 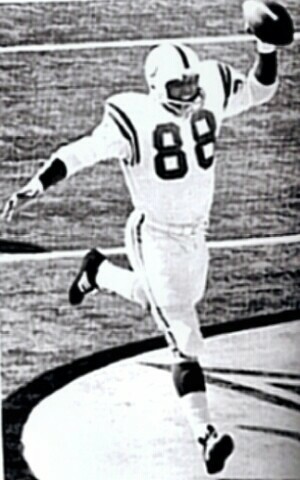 John Mackey was elected to the Pro Football Hall of Fame in 1992, becoming the second tight end (Mike Ditka, Class of 1988) to be enshrined in the Hall. Syracuse retired his number in 2007 and the John Mackey Award was established in 2000 to honor college football’s most outstanding tight end at the end of every season. While those honors speak to the quality of John Mackey as a football player, Mackey certainly continued to impact the NFL in other ways following his playing days. As the president of the NFL’s Players Association, Mackey led a lawsuit against the NFL to eliminate its reserve clause and begin the age of free agency in the league. Mackey’s impact on the league can most recently be seen in 2006, with the ratification of an NFL labor agreement, known as the “88 Plan”. The plan, named for Mackey’s number, provides funds for nursery care, home care and day care, as well as other needs to ex-players suffering from dementia or Alzheimer’s disease. As the NFL continues its lockout, the health care of former players has been one of the biggest issues discussed in the negotiations for a new collective bargaining agreement. Both on and off the field, John Mackey changed the National Football League. Just as the passing attack started to become a key part in the gameplans of NFL offenses, Mackey joined the Baltimore Colts, instantly becoming one of Johnny Unitas’ favorite targets. Too big to cover for cornerbacks and too fast for linebackers, Mackey’s athleticism and size led him to be selected to five Pro Bowls. He was also a first team All-Pro three times. Mackey helped deliver the Colts’ only Super Bowl victory in Baltimore, catching a key 75-yard touchdown pass in a 16-13 win over Dallas in Super Bowl V. Following his career, Mackey became a key voice in protecting the rights of players. He led the charge for free agency in the NFL, and the NFL’s Players Association continues to try and build on the “88 Plan” in its quest to provide more health care for retired players during the negotiations for a new collective bargaining agreement. John Mackey placed a stamp on the game of football. Although he played mostly in the ’60s, his style of play on the field and his work for fellow players off of it can still be seen today. John Mackey was truly a “game-changing” player in the National Football League. This entry was posted on July 7, 2011 by Scott Kornberg. It was filed under Baltimore Colts, John Mackey and was tagged with Baltimore Colts, John Mackey, John Mackey Award, Pro Football Hall of Fame, Scott Kornberg. You don’t hear too much about John Mackey as one of the all-time greats, but he certainly was….unbelievably tough.